ATLANTA – September 25, 2017 – New options are now available for Western Star trucks. Michelin X Multi D Tires: Available for Western Star 4700, 4800, 4900 and 5700XE truck models, the new Michelin X® Multi D tire is a factory-installed option designed for best-in-class mileage performance and scrub resistance with no compromise to traction. Best suited for regional applications such as dry van LTL, food & beverage, pick up & delivery, tankers, energy, and construction, the Michelin X Multi D tires have a co-extruded compounding scrub resistant rubber for maximized tread life. 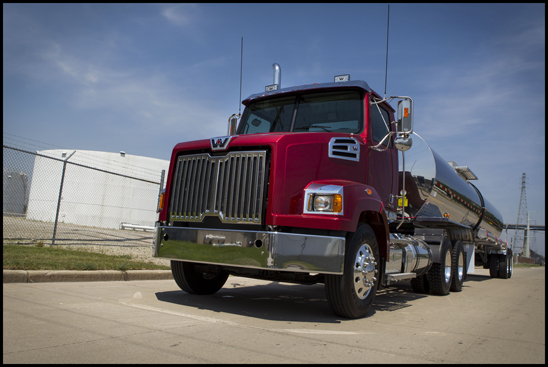 New Forward Lighting Option for 4700 Models: The Western Star 4700 can now be spec’d with factory-direct H4 halogen headlight bulbs. The bulbs provide a brighter light than regular incandescent bulbs for better visibility. The cost-efficient H4 bulbs are readily available and easy to install, so drivers can quickly replace them as needed and get back on the road. In-Cab 4-Battery Box: Western Star has expanded the capacity of its in-cab battery box to hold up to four batteries. Available for 5700XE day cabs, the batteries are under the passenger seat instead of the side of the chassis. This option can help extend the life of the batteries by protecting them from extreme weather conditions, road spray and harsh chassis vibrations. Customers can also spec a shorter wheelbase tractor, resulting in better wall-to-wall turning radius, lighter tractor weight, and increased fuel economy. New Forward Lighting Option for 4800 and 4900 Models: Now available for Western Star 4800 and 4900 truck models are factory-installed LED headlights. LEDs are particularly effective for night-time driving or foggy road conditions because they produce an illuminating, piercing light without blinding other road users. A low maintenance headlight option, LED headlights use less power from the truck, making them energy and cost-efficient over a longer period.